Of all the toys that I have made for the boys, these jumbo foam numbers have probably been the most popular. 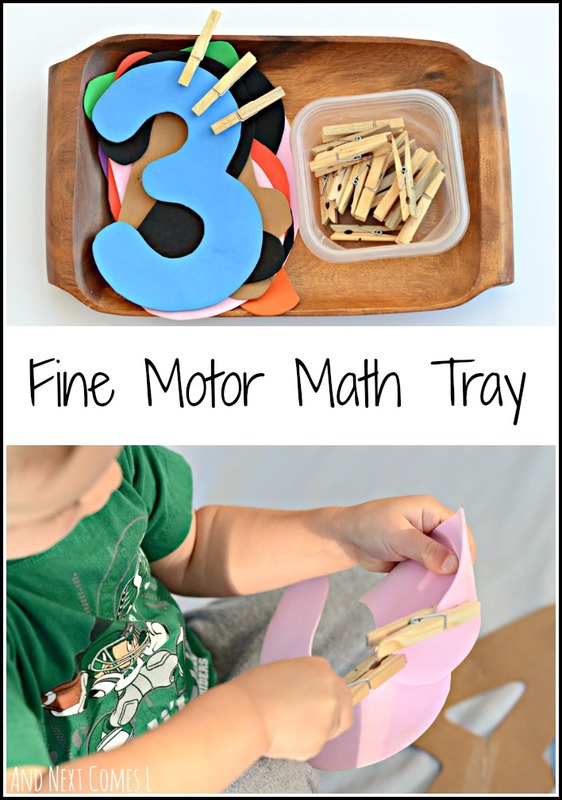 They have been great for lots of math activities in the past, but this particular fine motor math tray was inspired by my preschooler's (I still can't believe K is considered a preschooler now!) love for clothespins. This simple fine motor math counting activity for kids is a great way to work on fine motor skills while practicing number recognition and counting. This math tray required no prep (unless of course you have to make the foam numbers first, which I didn't). I simply grabbed our homemade foam numbers and some wooden clothespins. The task is quite simple too. Simply clip on the correct number of clothespins onto the foam numbers. This math tray was the perfect activity for my brand new three year old. He's been a pro-star at counting for a long time, just like his older brother, but he loved the added challenge of using clothespins. Opening and closing those clothespins is quite the fine motor workout! How simple and awesome is this?! Love it! Simple activities are always the best, aren't they?! Love the simplicity of this activity! I think I need to make some foam numbers now! Do it! The foam numbers work great for water play too! Great idea! Do you use a font to make your numbers or just write them by hand? Such a great idea. I will definitely try this with my son.